KREOD is a ground-breaking sustainable sculpture and London’s newest architectural landmark. The brainchild of Chun Qing Li, Managing Director of Pavilion Architecture, KREOD is an innovative architectural sculpture, organic in form, environmentally-friendly and inspired by nature. 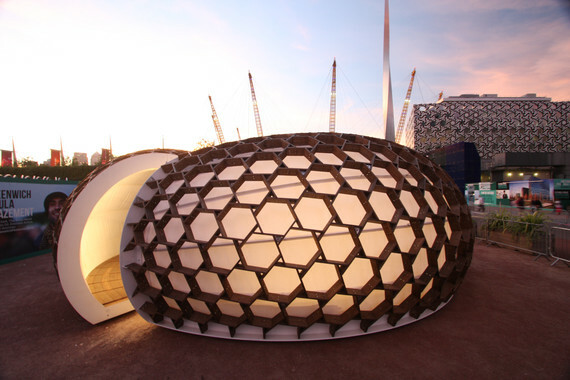 Resembling three seeds, these pods combine through a series of interlocking hexagons to create an enclosed structure that is not only magni­ficently intricate but secure and weatherproof. KREOD functions beautifully both as an architectural landmark and an imaginative exhibition space – its three pods can be combined in a variety of con­figurations or installed as free-standing forms. As part of the design team, Evolute was responsible for rationalizing KREOD’s complex input surface, designing the panel layout, the parametric detailing of the wooden members and outputting the production geometry for fabrication.